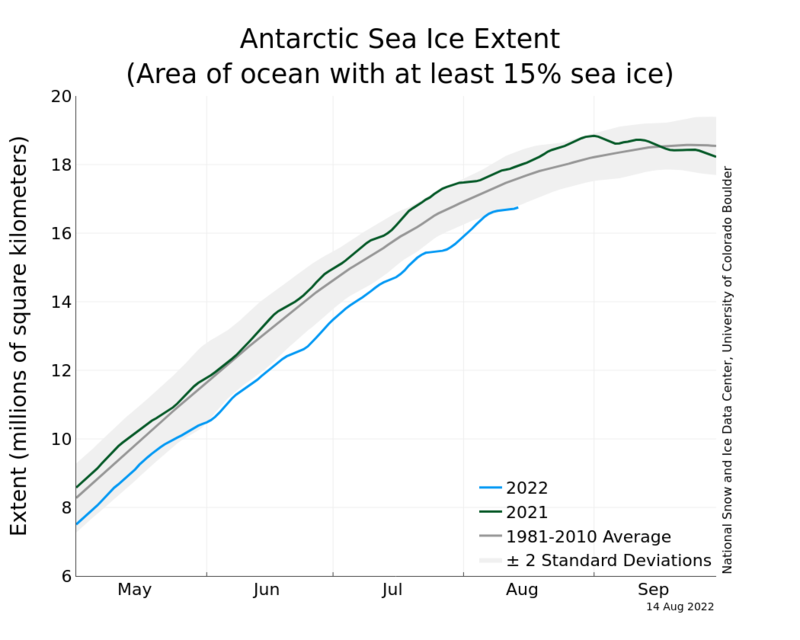 A recent paper in the Journal of Climate finds that most climate models erroneously predict that Antarctic sea ice extent decreased over the past 30 years, which "differs markedly from that observed." As noted in the abstract, Antarctic sea ice has confounded the models by instead increasing over the satellite era. In fact, it is currently at a record extent that is more than 2 standard deviations above the 1979-2000 average. The authors lament, "The negative [Antarctic sea ice] trends in most of the model runs over 1979 - 2005 are a continuation of an earlier decline, suggesting that the processes responsible for the observed increase over the last 30 years are not being simulated correctly." We examine the annual cycle and trends in Antarctic sea ice extent (SIE) for 18 Coupled Model Intercomparison Project 5 models that were run with historical forcing for the 1850s to 2005. Many of the models have an annual SIE [sea ice extent] cycle that differs markedly from that observed over the last 30 years. The majority of models have too small a SIE at the minimum in February, while several of the models have less than two thirds of the observed SIE at the September maximum. In contrast to the satellite data, which exhibits a slight increase in SIE, the mean SIE of the models over 1979 - 2005 shows a decrease in each month, with the greatest multi-model mean percentage monthly decline of 13.6% dec-1 in February and the greatest absolute loss of ice of -0.40 × 106 km2 dec-1 in September. The models have very large differences in SIE over 1860 – 2005. Most of the control runs have statistically significant trends in SIE over their full time span and all the models have a negative trend in SIE since the mid-Nineteenth Century. The negative SIE trends in most of the model runs over 1979 - 2005 are a continuation of an earlier decline, suggesting that the processes responsible for the observed increase over the last 30 years are not being simulated correctly. I'm sure there's some way of massaging the data so as to make it agree better with the models. The loss of ice in the Arctic is much greater than the increase in ice in the Antarctic. But yes, there needs to be a better understanding about how Antarctic sea-ice works. Loss of sea-ice in the Arctic is greater than the gain in Antarctica. However, sea-ice loss has no effect on sea levels. Antarctica as a whole is home to 90% of the world's ice, and multiple papers show Antarctic land-ice is continuing to grow. Only melting of land ice can affect sea levels. Multiple papers since AR4, coupled to GRACE satellite observations as well as other sources show the Antarctic ice sheet losing mass, not increasing it. There was a presentation by Zwally recently on ice sheet loss in Antarctica, but it hasn't been published yet. "...the processes responsible for the observed increase over the last 30 years are not being simulated correctly." Precisely. Ignoring solar irradiance, solar wind, cosmic rays, and misunderstanding cloud effects, and over-stating the impact of CO2 produce a crap model. A 30-year error should drive the modelers back to their basic assumptions. Global warming is a hoax. Your life time is a blink of an eye in history. Nobody has any real data from prior to the 1950's. And that is not great data. Worry about other things. Global warming: Greatest hoax since Piltdown Man.